The just concluded Kenya Power and Lighting Company (KPLC), Rights Issue has recorded a 3.17% over subscription totaling Shs.302 million. The rights issue raised Ksh9.830 billion, representing a 103.17 percent subscription, to successfully complete a move to restructure the company’s capital base. The national power utility was seeking to raise Ksh9.528 billion through issuance of an additional 488,630,245 million new shares. While announcing the results to the media, Kenya Power and Lighting Company Managing Director and Chief Executive Officer, Eng. Joseph Njoroge, said he was pleased with the positive response to the rights issue which he termed as a reflection of the confidence shareholders had in the company’s future. “In spite of the short shares offer period, the response from the market to the Rights Issue was highly enthusiastic. This success can be attributed to the unwavering trust of our shareholders in KPLC board’s vision and its management strengths. This is also a clear indication of the level of confidence that investors and Kenyans have in the country generally; and in our business specifically,” said Eng. Njoroge. Total number of new shares under entitlement stood at 284,894,529 shares which yielded Ksh5,555,443,315.50. Some 4,619 shareholders applied for additional new shares amounting to Application Ksh4,274,897,250. Out of this 4,572 applicants received full allotment for the additional shares. Following this subscription level, all shareholders who applied for up to 500,000 new shares will receive full allocation. Any shares in excess of 500,000 will receive an 89.43905% allotment rate, rounded down to one share. Eng. 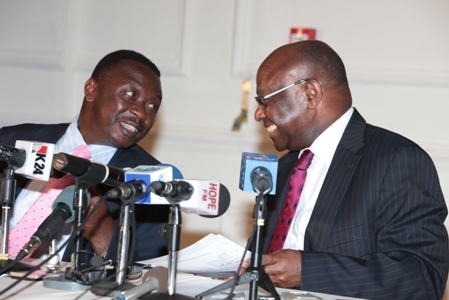 Njoroge noted that the decision by the Government not to take up its Rights had given impetus for non- shareholders to increase their shareholding in the company and new investors to participate in the process by taking up the Government that were renounced and traded at the Nairobi Stock Exchange. “This exercise came at a critical time of the festive season but we are grateful it was oversubscribed and within a record time. The process has so far run smoothly and we will only have 47 refunds to make from the transaction,” said Jimnah Mbaru, Chairman of Dyer & Blair Investment Bank, the Lead Transaction Advisor and Lead Sponsoring Stockbroker. The successful Right Issue was the final phase of the company’s capital restructuring programmes which also saw KPLC redeem 794,962,491 Redeemable Non Cumulative Preference Shares held by the Government by issuance of 76,622,891 new ordinary shares as consideration for the redemption and a share split. KPLC will invest the funds raised from the Rights Issue in the refurbishment and further development of the power delivery system, in the endeavor to meet demands of an expanding economy. Targeted projects will help KPLC reduce losses in the system as well as enhance quality and reliability of power supply to all categories of customers throughout the country. Electronic crediting of CDS accounts with new shares arising from the rights issue will take place on January 21st 2011 and commencement of trading of new shares at the Nairobi Stock Exchange will take place on January 24th 2010. I incorrectly read the Advertisment where I thought the Underwriters had been left with the Majority of the Paper. It turns out the Underwriters were left with Nothing and The Issue over subscribed. Mea Culpa. It was in fact a strong result.